Charity football match launches biggest Fortnight of Action to date. Friday 14 October saw the launch of our annual Fortnight of Action. Ex-professionals took on Scottish Politicians in a charity football match at Toryglen Regional Football Centre in Glasgow, with the ex-professionals winning 5-0. The event marked the beginning of a fortnight of anti-racism and anti-sectarianism actions across Scotland, promoting strong messages of equality and respect, and received positive coverage in local and national press. 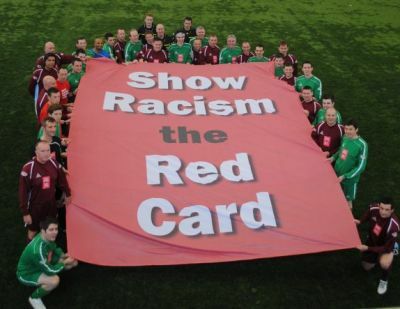 The launch event built momentum for all of the anti-racism and anti-sectarianism actions taking place at SPL, SFL, SWPL, SWFL and Scottish Cup 2nd round fixtures across the fortnight. Along with the community initiatives taking place across Scotland; ranging from anti-racism and anti-sectarinaism football festivals, cultural projects and supporters initiatives, to name a few. We look forward to seeing more positive coverage and support throughout the fortnight.